John Challis recounts his arrival in Herefordshire and why he and his wife, Carol, decided to buy Wigmore Abbey. Arriving there in the late ’90s, they threw themselves into the task of restoring the abbot’s lodging – the only habitable part remaining of what had once been a great monastery. Being Boycie is the story of a born actor who embraced the idea of role-play as a child and matured into a character actor of great originality and distinctiveness. Boycie and Beyond is the second volume of John Challis's autobiography. It covers the years 1985-2012 and describes his continuing love of live theatre. Reggie ffinch-Leigh with his wife, has sold up his business for a fortune and retires from the street markets to Mortimer Towers. Suddenly, he finds himself broke and has to revert to trading in order to make a living. Reggie thinks he’s found a great wheeze to remake his fortune – dealing in fake paintings. He makes a great start, until, through no fault of his own, he ends up having his collar felt. But, once again, he gets away with it. 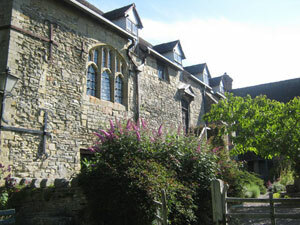 Wigmore Books is run from the historic Wigmore Abbey in Herefordshire and was set up in 2011 to publish books of general and local interest, fiction and non-fiction. Our first book is the autobiography of John Challis. "Being Boycie" is an enjoyable journey through John's early life and career and takes the reader up to 1985 when 'Only Fools and Horses' was established as a TV comedy favourite and the character of Marlene was first introduced. Part 2 "Boycie and Beyond" was published in 2012 and continues the story up to the present day.